‘The Delights of Learning Turkish’ is a self-study course book that takes the learner from the beginner level to the intermediate level in Turkish. It is designed for English speakers, targeting adult and young adult learners; especially for those planning to settle and live in Turkey or visiting Turkey for business or pleasure. 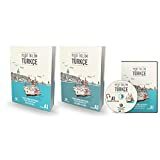 It is a comprehensive, explanatory approach to Turkish language teaching how to construct and use the language both in formal and colloquial forms with dialogues, examples, grammar points, vocabulary and exercises. It shows the grammatical structures in detail with examples, which enables the learners to make their own sentences instead of depending on off-the-shelf phrases. In the book, you can also find general information about the Turkish alphabet and Turkish language as well as notes on Turkish culture in daily life. Covering so many language points, this book is also a grammar reference that targets a wide range of audience including advanced learners. At the end of the book, you will find the keys to the exercises. There are also Turkish - English and English - Turkish glossary sections as well as Turkish proverbs and idioms added to the book with explanations. This course includes Lessons 1-16 from the Turkish Level 1 Program - 8 hours of audio-only effective language learning with real-life spoken practice sessions. Each lesson provides 30 minutes of spoken language practice, with an introductory conversation, and new vocabulary and structures. Detailed instructions enable you to understand and participate in the conversation. Practice for vocabulary introduced in previous lessons is included in each lesson. Topics include: greetings, numbers, meals, shopping, telling time, scheduling activities, and asking and giving directions. The emphasis is on pronunciation and comprehension, and on learning to speak Turkish. Turkish is a branch of the Turkic language family and is spoken as an official language by about 70 million people in Turkey and in Northern Cyprus. 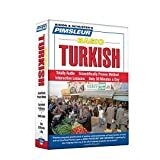 Pimsleur's Turkish teaches standard Turkish, which is based on the dialect spoken in and around Istanbul. Master Turkish with Learn Turkish - Word Power 101. 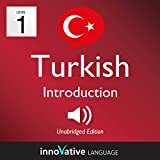 This audiobook is a completely new way to learn Turkish vocabulary fast - and for free! Start speaking Turkish in minutes with the powerful learning methods you will master in this book. 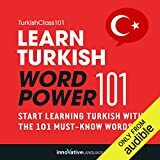 Purchase Learn Turkish - Word Power 101 today to start mastering Turkish vocabulary in the fastest, easiest, and most fun way possible! Do you want to develop a solid understanding of Turkish and communicate confidently with others? Through authentic conversations, vocabulary building, grammar explanations and extensive practice and review, Complete Turkish will equip you with the skills you need to use Turkish in a variety of settings and situations, developing your cultural awareness along the way. By the end of Complete Turkish you will have a solid intermediate-level grounding in the four key skills - reading, writing, speaking and listening - and be able to communicate with confidence and accuracy. *Complete Turkish maps from Novice Low to Advanced Low level proficiency of ACTFL (American Council on the Teaching of Foreign Languages) and from A1 Beginner to B1/B2 Upper Intermediate level of the CEFR (Common European Framework of Reference for Languages) guidelines. What else can I use to learn Turkish? This course includes Lessons 1-10 from the Turkish Level 1 Program - 5 hours of audio-only effective language learning with real-life spoken practice sessions. Get a chance to test drive the incredibly effective and efficient, world-famous Pimsleur Program. Each lesson provides 30 minutes of spoken language practice, with an introductory conversation, and new vocabulary and structures. Detailed instructions enable you to understand and participate in the conversation. Practice for vocabulary introduced in previous lessons is included in each lesson. The emphasis is on pronunciation and comprehension, and on learning to speak Turkish. Turkish is the primary language of some thirty million people. Anyone concerned with current social, political, and cultural developments in Turkey knows that a practical understanding of the basic patterns of modern Turkish is an invaluable skill that until now has been difficult to attain without extensive training. This superb grammar and exercise text, used successfully for years in Princeton University, enables English-speaking students — in and out of the classroom — to gain a quick and thorough understanding of modern Turkish. In a carefully arranged sequence of 23 lessons, Lewis V. Thomas, late Professor of Oriental Studies at Princeton, presents thorough coverage that allows the student to begin to use the basic patterns of modern Turkish without time-consuming and expensive private instruction. The method of instruction was devised after an extensive analysis of results in Princeton classrooms, and relies on exercises at the end of each lesson to test the student's grasp of the material. Beginning with the alphabet and numbers, Professor Thomas offers clear, concise coverage of articles, adjectives and nouns, common infinitives, personal pronouns, and elementary verbs. As the student's comprehension of basic elements develops, further lessons deal with more complicated subjects such as the possessive construction, past general verbs, postpositions, the partitive, progressive verb forms, and abbreviating verb forms. A complete Turkish-English glossary translates new vocabulary occurring in the exercises. Norman Itzkowitz, Professor of Near Eastern Studies at Princeton University, has skillfully made the necessary revisions and additions to complete Professor Thomas' work. For anyone who needs to communicate in this important and influential language, Professor Thomas' proven course, now in an inexpensive paperback edition, is the most effective method available. Absolutely new to Turkish? Don't know where to start? Welcome to Introduction to Turkish, Volume 1. Before you take that trip to Turkey, get a solid foundation of Turkish first! Master the basics of Turkish conversation the fun, fast, and easy way! Discover or rediscover how much fun learning a language can be with the future of language learning. 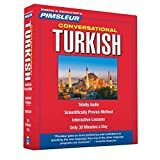 Try this audiobook and start speaking Turkish instantly! Are YOU planning a trip to Turkey? Are YOU Moving To Turkey? Do YOU have Turkish Heritage? Be Honest how Cool would it be if YOU knew Turkish! Maybe YOU want, Impress a Beautiful Turkish women or man? If YOUR ready to learn Turkish TODAY! Scroll up, grab this book, and take the first steps to get the most out of YOUR Turkish Experience!